This article is about the current train operating company. For other uses of the name, see Thameslink (disambiguation). Govia Thameslink Railway (GTR) /ɡoʊˈvaɪ.ə ˈtɛmzlɪŋk/ is a train operating company that operates the Thameslink, Southern and Great Northern (TSGN) rail franchise. Within the franchise, GTR runs the Thameslink, Great Northern, Southern and Gatwick Express airport services. GTR is a subsidiary of Govia, which is itself a joint venture between Go-Ahead Group (65%) and Keolis (35%). The company was awarded the TSGN franchise in May 2014, under a new contract whereby the Department for Transport will pay GTR £8.9 billion over the seven years and receive all revenue. It began operating services under the Thameslink and Great Northern brands in September 2014. Southern and Gatwick Express became part of GTR in July 2015, making it the largest rail franchise in terms of passengers, staff and fleet in the UK. The franchise is unusual as a management contract where fare income does not go to GTR, which is simply paid a fee for operating the service, so GTR carries less revenue risk. This form of franchise was chosen because of long-term engineering works anticipated around London, which would be a significant challenge to organise within the normal form of franchise. In June 2016, amongst criticism of the performance of its services, Go-Ahead warned of lower than anticipated profits on the franchises, leading to 18% drop in the Go-Ahead share price. Passengers had previously rated its Thameslink service as the worst in the country. 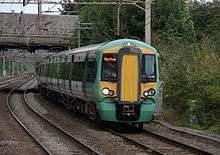 Only 20% of Southern trains arrived on time in the year from April 2015 to March 2016, and there was an ongoing industrial dispute over driver-only operated trains. 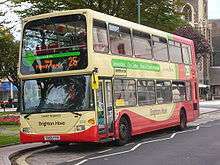 On 12 July 2016, after 15% of Southern services were cancelled for a period of weeks to improve service reliability, Mayor of London Sadiq Khan called for GTR to be stripped of the franchise. On 15 July 2016 Rail Minister Claire Perry resigned. Govia Thameslink Railway has operated Thameslink and Great Northern services since 14 September 2014. Thameslink is a 68-station main-line route running 225 km (140 mi) north to south through London from Bedford to Brighton, serving both London Gatwick Airport and London Luton Airport, with a suburban loop serving Sutton, Mitcham and Wimbledon and on weekdays a suburban line via Catford and Bromley South to Sevenoaks. Great Northern is the name of the suburban rail services run on the southern end of Britain's East Coast Main Line and associated branches. Services operate to or from London King's Cross and Moorgate in London. Destinations include Hertford North, Welwyn Garden City, Stevenage, Peterborough, Cambridge and King's Lynn. The Southern and Gatwick Express brands joined Govia Thameslink Railway on 26 July 2015. Southern routes run from London Victoria and London Bridge through the South London suburbs of Battersea, Norbury, Peckham, Sydenham, Crystal Palace, Norwood, Croydon, Streatham, Purley and Sutton to towns surrounding London like Caterham, Epsom and Tadworth. Further afield, Southern also serve Redhill, Tonbridge, Uckfield, East Grinstead, Gatwick Airport, Brighton, Ashford (Kent), Worthing, Hastings, Portsmouth, Eastbourne, Horsham, Southampton, Littlehampton and Bognor Regis. Additionally, Southern run West London route services from Milton Keynes to South Croydon via Watford and Clapham Junction. Since 2008, Southern has operated the Gatwick Express service running from London Victoria to Gatwick Airport and Brighton. 1 2 Topham, Gwyn (23 May 2014). "FirstGroup loses Thameslink franchise to Go-Ahead joint venture". The Guardian. Retrieved 24 May 2014. ↑ "New rail franchising deal set to transform passenger services across London and south east". Department for Transport (DfT). 23 May 2014. Retrieved 24 May 2014. ↑ "Govia wins Thameslink rail franchise". BBC News Online. 23 May 2014. Retrieved 24 May 2014. ↑ Ben James (18 June 2016). "Fines issued to rail provider GTR for poor performance slammed". The Argus. Retrieved 20 June 2016. ↑ Simon Usborne (8 July 2016). "All aboard the Southern chaos train: the commuters caught in a war on rails". The Guardian. Retrieved 8 July 2016. ↑ "Thameslink woes hit Go-Ahead shares". BBC News. 14 June 2016. Retrieved 20 June 2016. ↑ Craig Richard (17 June 2016). "Boss of Epsom's main train operator Govia Thameslink Railway takes home £2.1m paycheck despite "appalling service"". Your Local Guardian. Retrieved 20 June 2016. ↑ Joseph Watts (17 June 2016). "Govia Thameslink Railway boss refuses to defend CEO £2m pay". Evening Standard. London. Retrieved 20 June 2016. ↑ Gwyn Topham, Matthew Weaver (12 July 2016). "Take Southern rail franchise off operator, urges Sadiq Khan". The Guardian. Retrieved 16 July 2016. ↑ "Rail minister Claire Perry resigns". BBC News. 15 July 2016. Retrieved 16 July 2016. Wikimedia Commons has media related to Govia Thameslink Railway.